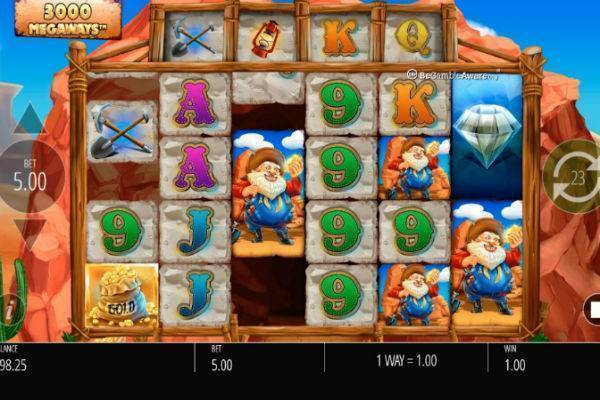 Diamond Mine is a Megaways is a slot from Blueprint Gaming. As with other Megaway games, you’ll notice right away that this game is not going to hold back. It has 6 reels, with 4 of them having 4 rows instead of just 3, and sometimes the reels can hold up to 7 symbols. It’s all proudly bombastic and adds up to an astounding 117,649 ways to win slot. The theme is of the American Wild West, and the game is packed with extra spins and cascading reels that’ll automatically drop in new symbols after a win. Indulge in this monster slot at one of these tried and tested online casinos. Despite its rather unconventional look, Blueprint Gaming has made it easy to get started with Diamond Mine. Bet size is on the left side of the screen and you can adjust it to fit your budget. The 117,649 lines are taken care of, and you’ll be betting on them all the time. So once you’ve adjust your bet size, you can press the green Spin button on the right side of the screen. In the base game, the fixed jackpot is won by spinning 6 Diamond symbols all on adjacent reels. This will give you 50x your bet. The next highest prize is 5 Diamonds, which will score you 25x your bet. The other symbols pay significantly less, so keep your fingers crossed for the Diamonds. That’s not a whole lot of money for a jackpot prize, you might rightly say. You’re right. 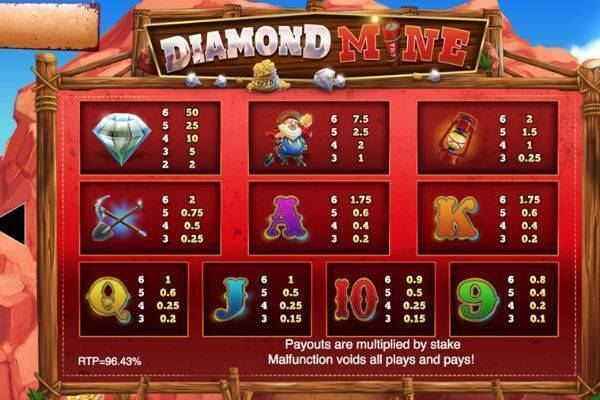 But because Diamond Mine is a Megaways game, with 117, 649 ways to win, and an extra-large grid to fit in more symbols, you’ll be hitting more wins per spin than your average slot game. 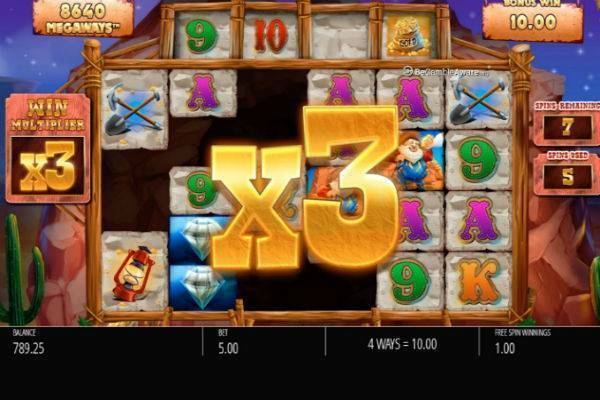 Then there are unlimited multipliers in the Bonus game where the huge wins can be found. Cascading Reels: When you have a winning payline, the symbols that formed the win will disappear, everything else will drop into place with new symbols appearing to fill up the old spaces. So sort of like the reels in NetEnt’s Gonzo’s Quest or even Microgaming’s Tomb Raider. It’s all a bit like getting an extra spin with every spin and Blueprint Gaming calls these wins “Reactions”. Reactions are even hotter during the Free Spins Bous Round because they come with increasing multipliers. 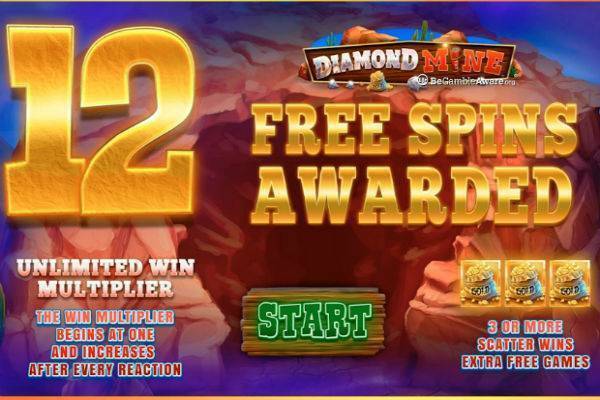 Free Spins Bonus Round: Spin 4 Scatter symbols (the trollies of Gold) and you’ll trigger a round of 12 free spins. Every extra Scatter you get will give you an extra 5 spins. Not only are the spins on the house, but each spin comes with a growing multiplier that increases after every reaction. What’s even more amazing is that there’s no cap on how high the multipliers can get! If you get more Scatter symbols on the very top row, then there’s more spins added to the round. Diamond Mine has a cartoon style theme based on the American Wild West, back when men used to mine for gold and treasures. It’s actually not so different from the Bonanza slot (if you’ve tried it), but the theme here has more red to it and cactus to decorate the landscape. It’s not the kind of artwork that will win any prizes, but it’s pleasant enough to look at and the action all rolls smoothly. 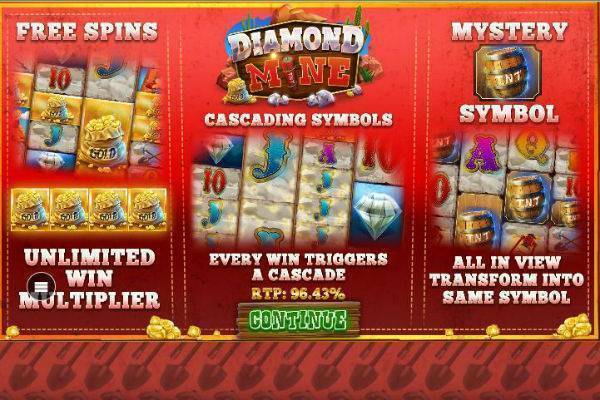 Diamond Mine Megaways is a loud, unapologetic and bombastic slot with more paylines than we can count. Blueprint Gaming says it’s 117,649 ways-to-win, and we’ll take their word for it. An unorthodox grid with more reels and more rows allows all this to happen. With so many paylines and a RTP of 96.43%, you’ll see frequent wins; however, the truly big prizes come when you trigger the free spins bonus game which has unlimited multipliers. It’s absolutely crazy and you have to try it to believe it. Give it a shot at one of these trusted online casinos.